Back at CES 2012, Mercedes showcased DICE or Dynamic and Intuitive Control Experience. 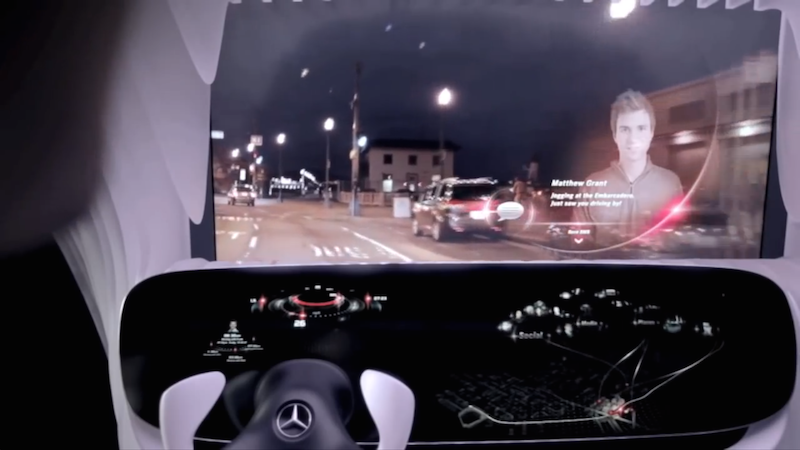 The concept shows a futuristic looking car dashboard and windshield which acts as a head-up display (HUD) in its entirety. The HUD shows you relevant information as your drive around but not directly in front of you. Information is shown as though it were floating in air outside your vehicle and superimposed over buildings, other cars, landmarks or streets. This was a concept back in 2012 and with autonomous cars gaining traction in 2014, the concept may spark interest once again. With your car driving you around, your hands will be free to interact with a system like this. Whether this dashboard concept ever reaches primetime or not, it is definitely worth fantasizing about. Check out this video from CNET to see how it works. There is another video below it.